This sinkhole was created by a tragic industrial accident and continues to ravage the surrounding landscape. 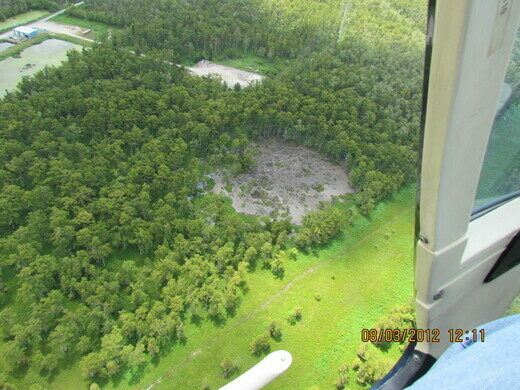 Discovered in 2012, the Bayou Corne Sinkhole is a churning vortex of destruction that has been slowly dragging the surrounding forest into the ground after a massive mining accident. The massive underground salt dome under Baton Rouge run by the Texas Brine Company was a profitable mining operation right up until its ground-shaking collapse created a monstrous sinkhole. According to studies, the salt cavern was breached through a side wall which was thought to be impossible. Initially the hole was a huge eight acre void but as the waters and earth rushed to fill in the underground caverns the voracious maw spread to swallow 15 acres and counting of trees, dirt, and underbrush. The collapse of the salt dome shook the land aboveground causing many people to think that it was an earthquake that caused the hole, although the converse is true. Over 300 people were evacuated from the area with no clear idea of when they might even get to return. Despite there being no evidence that Texas Brine was negligent in their practices, the company is still paying weekly restitution to the affected parties. As of now, the expanding hole has grown to 25 acres and continues to devour the landscape. This Louisiana folk art gallery is a gnarled collection of driftwood homonculi. A collection that chronicles the history of a leper colony that became a refuge.